A superb linear walk across the Warcop Range from Murton to the head of Lunesdale, including the summits of Roman Fell, Little Fell and Mickle Fell. The remains of a flare? Back in January I was contacted by Stuart of the lonewalker.net website about possbile routes on to Mickle Fell. 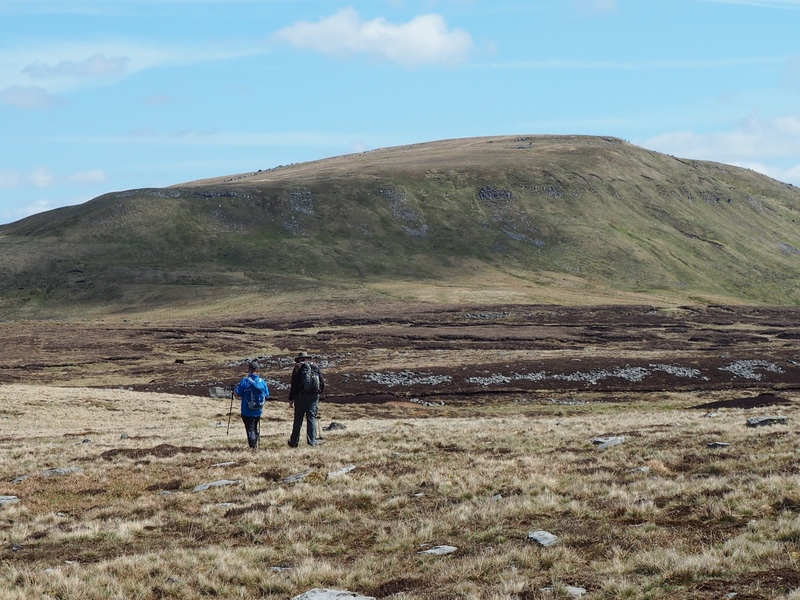 After exchanging a few emails we’d arranged a linear walk visiting Little Fell and Mickle Fell in the Warcop Range on the designated non-firing weekend towards the end of May. Joining us on the walk was Paul, who I’d done a couple of walks with at the end of 2014. Initially meeting Paul at a small parking area on the road to the east of Grains o’ th’ Beck I then drove us to Murton where we met Stuart. Amazingly, considering the walk had been arranged over four months previously, the early cloud was beginning to clear and it was shaping up to be a fine day. Indeed, with only a slight breeze, it was the first time this year I felt able to bare my arms and just wear a t-shirt. From Murton we aimed to take the footpath contouring around the lower slopes of Mell Fell to reach the footbridge over Scordale Beck. In one of those instances where the path on the ground doesn’t follow the direction of the right of way we ended up in a pasture below the proper route. Instead we made for the footbridge marked on the map at NY746210 only to discover it was no longer there. With Hilton Beck slightly too wide to ford comfortably it was easy enough to follow the north bank of the beck above its confluence with Swindale Beck to reach the large footbridge over Scordale Beck. Having crossed Scordale Beck we next tackled the steep slopes of Roman Fell via Low Hause and High Hause. It was a stiff but enjoyable climb with good retrospective views of Scordale and Swindale. Some care was required as we navigated the gritstone boulders of the Slape Stones but having clambered over those it was then a straightforward walk above Roman Fell Scar to reach the sprawling shelter and cairn marking the summit of Roman Fell. From Roman Fell we dropped down to the ruined sheepfold in the col with Tinside Rigg before taking the fine path, which I’d first come across on my previous visit to Roman Fell, that slants down to the head of Swindale. Crossing the bridleway, one of the few rights of way in the Warcop Range, we next climbed up alongside Christy Bank Sike to reach another large ruined sheepfold. From there we continued our pathless progress passing rashes of gritstone boulders, numerous shake holes and some rusty shells, a reminder that particular care needs to be taken when walking in the Warcop Range. Finally arriving on the grassy summit plateau of Little Fell we visited the shelter that contains the dilapidated remains of the Ordnance Survey trig point before heading for the summit of the fell 0.4 miles to the north. I was somewhat surprised to find that it was now marked by a small pile of stones, I am fairly sure this is a recent addition as the summit was completely bare on my first visit back in 2011. Between Little Fell and Mickle Fell is a quite stunning landscape of peat hags, best viewed from the small grassy escarpment to the north-east of the summit. Rather than make a beeline for Mickle Fell across this rough terrain we aimed for a quad track that largely avoids the rougher ground by curving round to the rocky Arnside Rake and then on to Mickle Fell. Briefly losing the quad markings we didn’t entirely escape the peat hags but thankfully the ground was remarkably dry. After I made a brief detour to the currick on Arnside Rake I caught Stuart and Paul up just in time for the final ascent of the day, a steep pull up on to Mickle Fell. 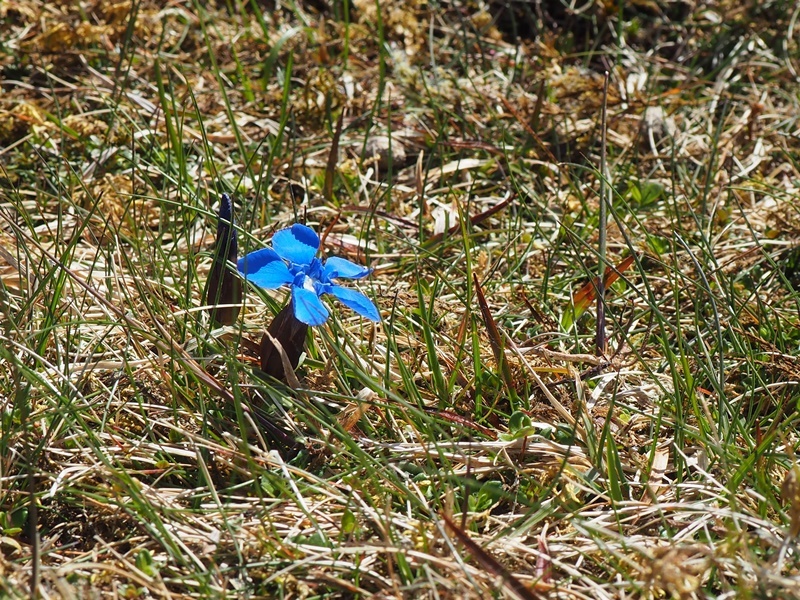 Remembering where I’d seen them on a previous visit I was delighted to find a small patch of Spring Gentian, one of England’s rarest flowers – it is found only in a couple of places in upper Teesdale. Mickle Fell is surrounded by some very rough moorland but the upper slopes of the fell are covered in short grass which is an absolute joy to walk on, especially on such a beautiful day. As we neared the summit cairn Paul (a proud citizen of Co. Durham) and I indulged in a bit of playful banter about which county Mickle Fell belongs to. Historically of course it was the highest point in the North Riding of Yorkshire until the boundary changes in 1974 saw it transferred to Durham. Upon reaching the cairn I was amused to see someone had planted a small Yorkshire flag on it. As the fifth highest summit in the Pennines the view from Mickle Fell is suitably extensive and includes much of the North Pennines, many of the summits of the Yorkshire Dales (including the triumvirate of Whernside, Ingleborough and Pen-y-ghent) and a large portion of the Lakeland skyline. My favourite part of the view though was into upper Teesdale where the waters of Cow Green Reservoir were almost sapphire like in the distance. After eating our lunch by the cairn we set off east aiming for the trig point, situated over a mile away from the summit. Once again we followed a nice grassy path with modest limestone features dotted about, including the now ubiquitous shake holes. Moments after arriving at the trig point a local gamekeeper appeared on his quad bike. Slightly apprehensive we might get in to trouble as we weren’t on one of the approved routes on or off Mickle Fell my worries were groundless, he seemed quite unconcerned by our presence and indeed we had quite a long chat with him before he went off looking for signs of foxes. To the south-east of the trig point there was a noticeable shift from grassy limestone to heather and peat. Here we joined a shooting track which wound down below High Crag and which we ultimately followed on an extended descent all the way back to where we’d left Paul’s car on the B6276. The highlight of this final section of the walk was the brief diversion to view Fish Lake, a lovely sheet of water situated between the flanks of Standards and Close House Crags. Logistically our plan for a linear walk had come off perfectly. In addition we could not have asked for better conditions, we enjoyed plenty of sunshine tempered by a nice cooling breeze and the ground underfoot was dry. The scenery was varied and interesting and the company most agreeable. In addition to seeing the spring gentians we also numerous moorland birds including skylarks, golden plovers, curlews, lapwings, snipe, pipits and a dunlin. All in all a super day out in the North Pennines. For Stuart’s photos from the walk please visit the Lonewalker website.